The dollar store is a haven of supplies, especially if you are organizing on a budget. If your home needs a bit of organizing and you only have a few bucks to your name, head to your nearest dollar store and load up on a few of these cute, practical baskets for a few quick projects around the house. 1. Closet organizing by DIY Energy. 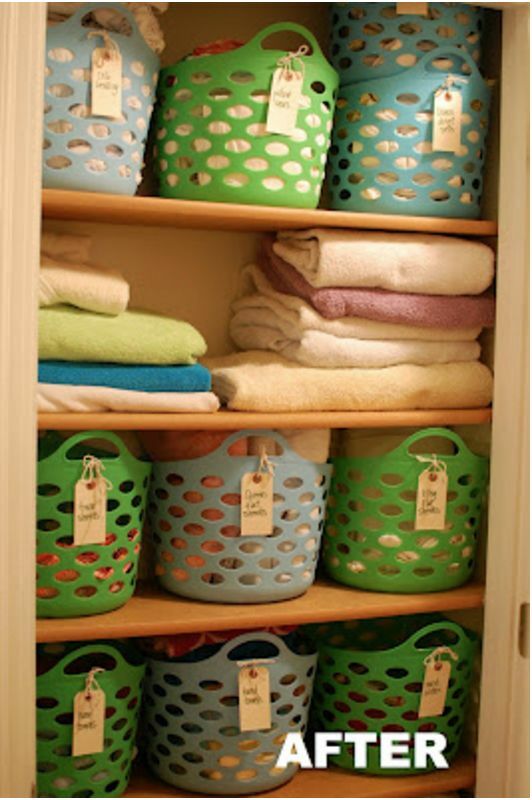 Snag three or four of these deep laundry baskets and some S-shaped hooks and attach them to the shelves in your laundry room. This no-fuss project is the perfect way to store single socks or separate towels and intimates. Try hanging these baskets in the kid's closet to organize their socks or clothes they can't wear quite yet. 2. Laundry organizing by Home Made Ville. Turn your laundry room into an organized haven. The two baskets on the wall are from the dollar store, as are the J-hooks holding them up (use two per basket). Check out the website above the photo for a download of the printables so you can label each basket. 3. Under the sink organizing, seen on DIY & Crafts. Are your dish rags constantly cluttering the area under your skin? 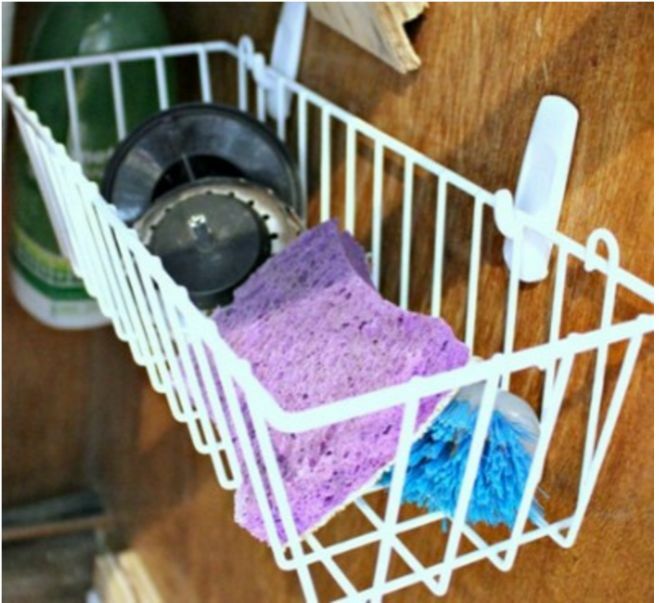 Grab sticky hooks and a dollar-store plastic basket. Attach the hooks to the inside of the door and hang. Store rags, sponges, stoppers and other cleaning materials off the ground and within easy reach. 4. 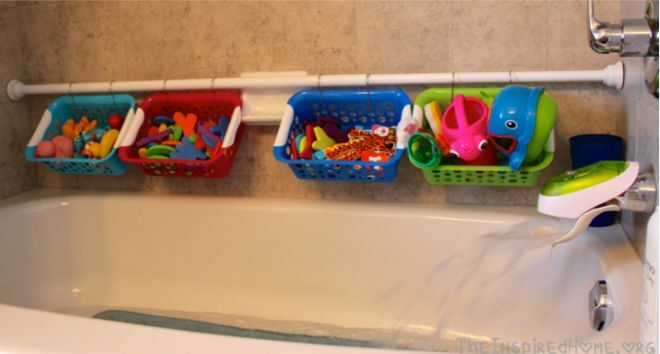 Bath toys organizing by The Inspired Home. Keeping the bathtub neat and tidy is a snap with this fun project. Snag three or four rectangle baskets from the dollar store. You'll also need an extra shower curtain rod. 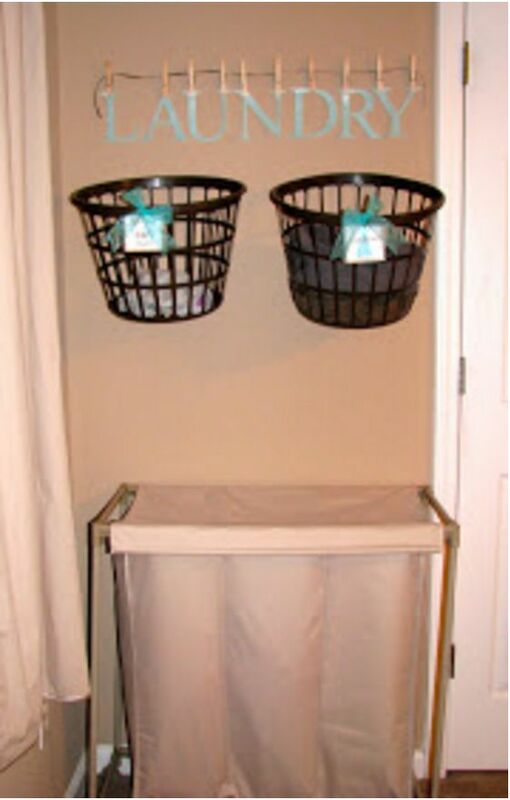 Attach the baskets to the rod using zip ties or shower hooks. Presto: no more slipping on kids toys when you climb in the shower! 5. Bathroom drawers organizing by The Summery Umbrella. 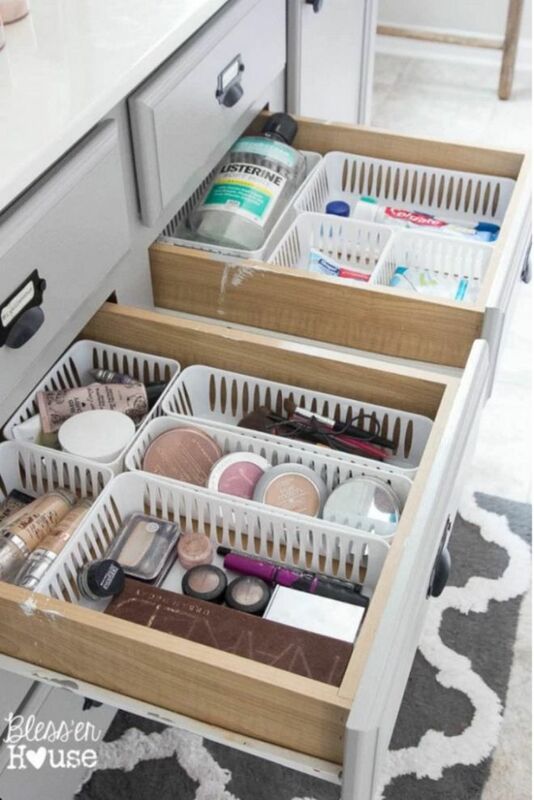 Snag a bunch of these small white baskets (a few are silverware organizers) from the dollar store to tidy up your makeup drawer. Not only do they make finding your favorite gloss a snap, they're easy to clean. Just take them out and toss them in the dishwasher as needed. 6. 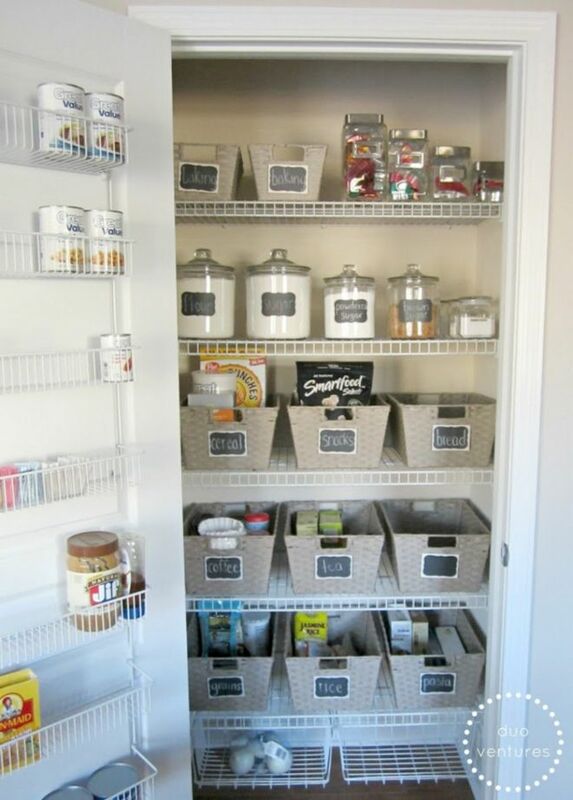 Pantry organizing by Duo Ventures. Is your pantry a disaster? Keep everything tidy, with a few baskets from the dollar store. Label each basket so you can find what you need quickly. As an added bonus, you'll be able to see when you actually are out of peanut butter instead of finding a jar hidden behind a mess of boxes, after you come back from the store. 7. Decorate AND organize with this cute idea by I Heart Organizing. Try this cute DIY project when you want something with a little more pop. Using a dollar store basket, and cotton filler cord (buy white and colored if you want to save time dying the rope) and a hot glue gun, this basket goes from drab to fab. Applying the rope is as easy as gluing it in a straight line around the basket from top to bottom. You'll want to make sure it's glued securely, so don't be shy with glue! 8. Kids' room organizing by Diane S. on Hometalk. 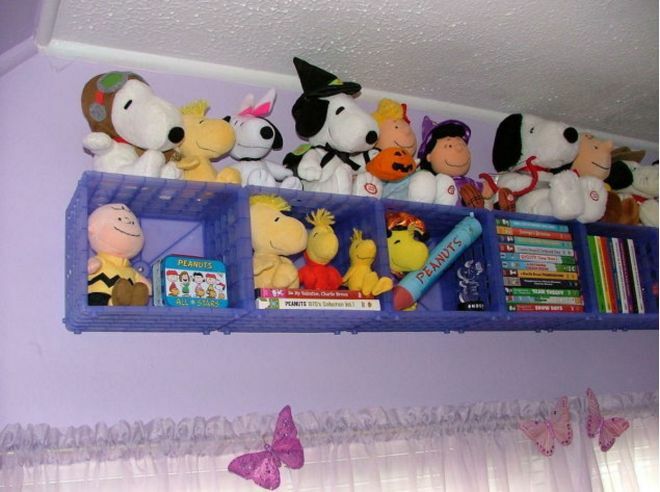 Keep the stuffed toys and books up off the floor with this clever idea. This design uses a stackable shelving unit, which you may not find at your dollar store. Individual baskets would work just as well. 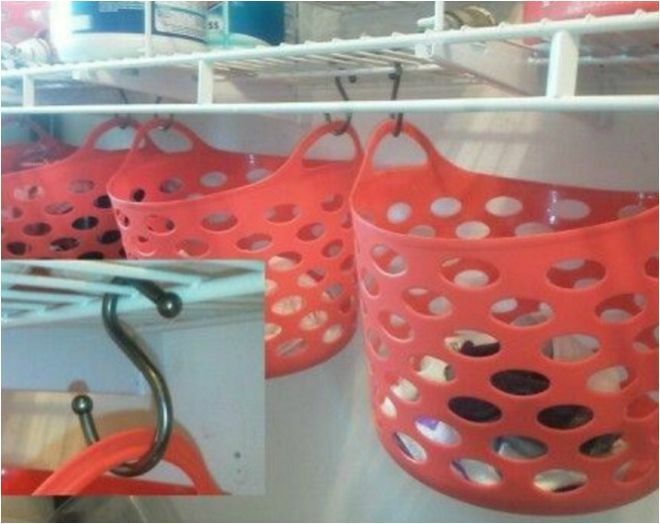 Attach the baskets to the wall using an anchor and a screw. Instant out-of -the-way storage for items your kids don't or can't play with. 9. Linen closet organizing by A Bird And A Bean. Keeping towels and linens nice and neat is a hassle! Simplify your life with a few of these handled-baskets. Pick a few of your favorite color, attach a personalized label and keep everything nice and neat with very little effort. Bonus: Take them to the laundry room with you, fill them with towels and slip them back on the shelf. 10. 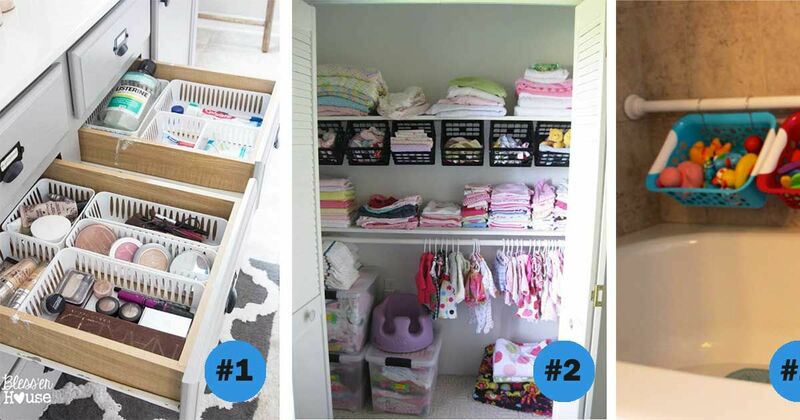 Nursery closet organizing by Reality Daydream. If the kid's closet is a disaster, use a few baskets from the dollar store to keep everything tidy. 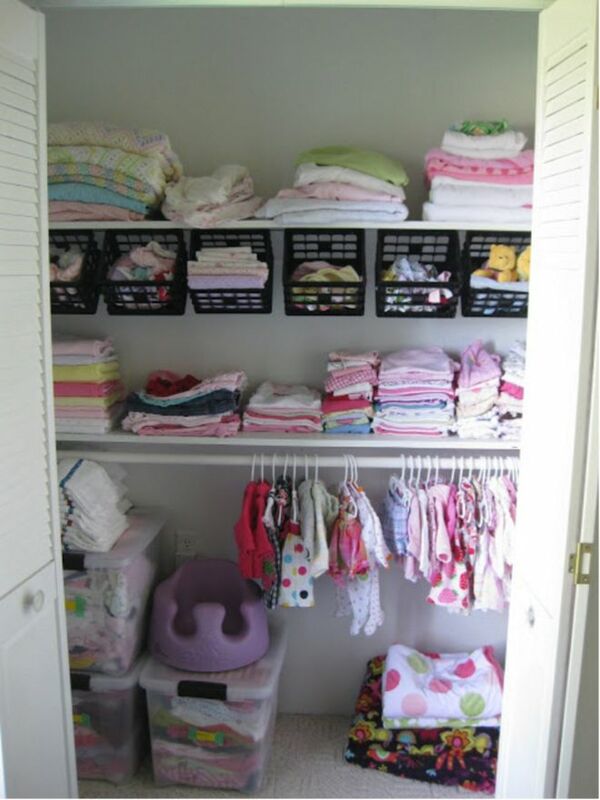 Hang a line of smaller baskets using anchors and sort burp cloths, bibs and rompers into the baskets. Easy to grab, easy to put away! Do you shop at the dollar store? What are your favorite things to use around the house? Share your ideas in the comments below!